Any cake that can double as colonoscopy prep is not welcome in my department, Design. In general we prefer delightful treats in bite sized-portions. I’m thinking that next year I might request a cake so small and luxurious that my sidekick, Greg, will be assigned to stand next to me to hold my candle. That’s another rule of Cake in Design. The candle is limited to one. This probably has more to do with my boss Elsbeth and I being a combined 833 in dog years. We share a mutual disinclination to blow out a forest fire of eyebrow singeing flames. This week my buddy and colleague (not) Under Ling (anymore) celebrated her natal date. (not) Under Ling (anymore) told me that she didn’t want a cake and was more in the mood for a fruit tart. Me: Could you go for a raspberry tart? 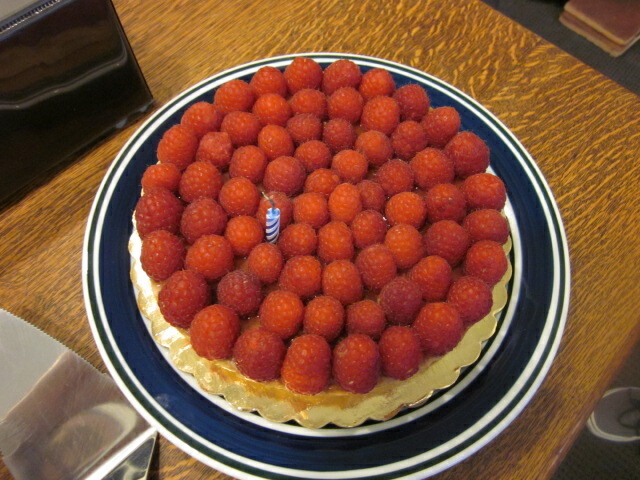 How about a raspberry tart like this one decorated with a single candle? (not) Under Ling (anymore): Yes. And don’t worry I’ll act completely surprised like I had no idea it was coming when you guys give it to me. Me: Possibly you could appear so shocked, you could fake fainting? 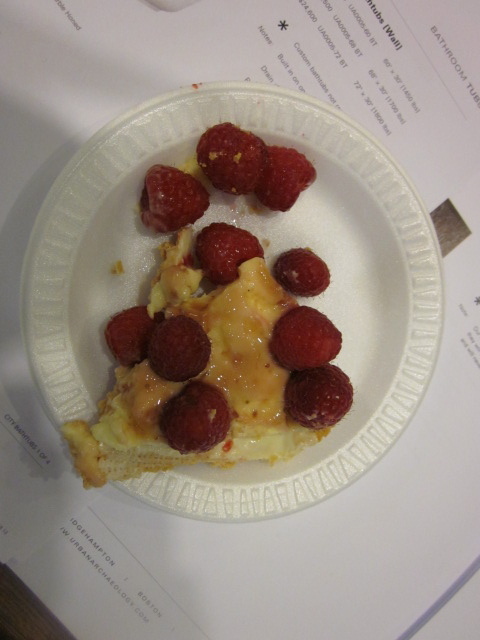 I called Le Pain Quotidien and special ordered a seven-inch raspberry tart for my colleague. Elsbeth gave me the payment in cash. 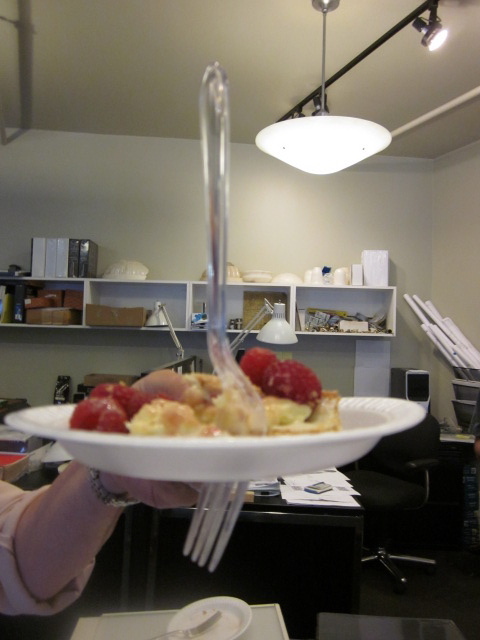 Greg, who does all the heavy lifting including that of 14 ounce tarts, picked it up. Then, we had to come up with the latest harebrained ruse so (not) Under Ling (anymore) could feign surprise. Me: Okay, go now — get her! Elsbeth: Where did our Summer Intern go? Greg: Wasn’t she just supposed to get (not) Under Ling (anymore)? Annoyed, I left our office, and thoroughly scoured our warehouse for our missing Summer Intern. She was either expertly hiding from me, or she instantly found a paying gig, or she was living my fantasy i.e., she walked out the door and just keep going. I returned to our office intern-less with this report to my waiting Superior. Me: I don’t know where she went. Elsbeth: You took so long I thought you went missing! Greg: Like an episode of The Twilight Zone. Everyone who steps out to get (not) Under Ling (anymore) disappears! Elsbeth (to me): Just get (not) Under Ling (anymore). Me: Elsbeth wants the camera back. Now. (not) Under Ling (anymore) (muttering to self): Finally, I get my cake! We eat the cake baffled over what happened to our Summer Intern, but not that baffled that we sent out another search posse. Picture perfect slice (not) Under Ling (anymore) cuts for herself. Mangled slice (not) Under Ling (anymore) cuts for me. Coco: Your Summer Intern wants to know if she can come back upstairs now? Me: Was she down there with you all this time? Coco: Yeah. What the hell’s going on with you guys? Me: She was supposed to get (not) Under Ling (anymore) – not visit you! In response to Elsbeth asking me what happened to our missing Summer Intern I calmly explain to my superior that there was a miscommunication. Then I popped my fork through my plate. Stabbed plate held by Elsbeth. This entry was posted in Humor and tagged birthday, cake, fifty shades of grey, fruit tart, idiocy, le pain quotidien, office antics. Bookmark the permalink. I can’t WAIT to hear what our Georgetown masters degree Mike G. philosophizes on this one. Happy birthday (not) Under Ling (anymore)! Kudos to Greg for carrying the cake. Oops, forgot to click the notify of follow up box. (I didn’t get a masters degree anywhere, let alone Georgetown. Egging Mike G on Samantha? Are you channeling your inner Cole Porter Mike? You nailed it — those strawberries really do look like they were made by Dow. Those weird, jellied, too-red strawberries. And the “whipped cream” always has the consistency of insulation foam. 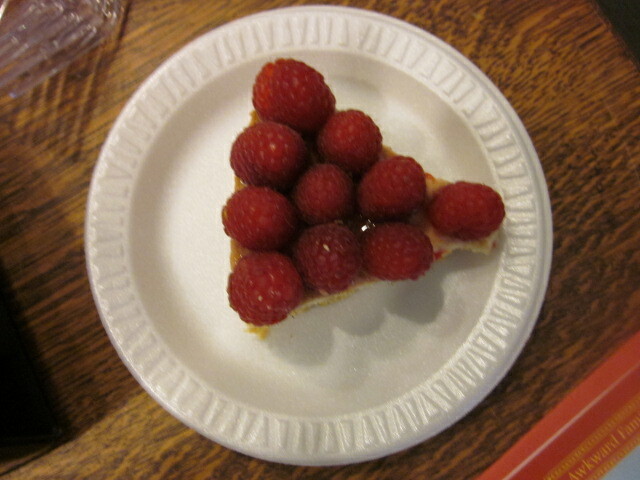 The raspberry tart looks gorgeous, though. Well, except for the slice that (not) Under Ling (anymore) cut for you. I love LPQ’s stuff. For your own birthday, how about getting a petit four? Yes, Madame W, you know those “weird, jellied, too-red” strawberries, too, but I would not go near insulation foam style whipped cream. LPQ’s raspberry tart was made with fresh fruit and some kind of light cream that didn’t bother my sensitive stomach at all, but possibly that fistful of lactaid pills helped, too. I think your combined age in dog years is 19, not 833! you know what’s fun? saying ‘coco colon cleanse’ after a few beers. that’s odd. i feel like i’m in spam since coming back to Chicago. I’m sure the Chicago Tourism Bureau loves that endorsement. funny.. i used to freelance for the now-shuttered Chicago Tourism Bureau. Thanks for bringing up bad memories! gaaaah! Oops! What can I say as explantion about that? I’ll fess up … when it comes to you, Jules, my powers of perception are extraordinary. I apologize in advance for bending every spoon in your drawer with my mind. Feh. Don’t you worry your pretty little head about it! That’s a relief! It’s comforting knowing that you’re cool about living with a drawer full of bent spoons. While I am not an employee where you work- could I become an honorary employee (around or about my birthday- September 15th to be exact)? You all have extremely good taste in……cakes!!!! Hm, that’s an intriguing suggestion Dorothy. I could lobby Elsbeth for this since we’re not scheduled to have another cake until Greg’s b-day next February. This was pretty amusing. The summer intern…yeah I remember those days. Poor summer intern she probably didn’t get any raspberry tart, right? We offered, but she declined. I wasn’t surprised. She has very specific food preferences — cheese, bread and microwaved popcorn. They really cleanse you colon? Amazing. I shall eat a strawberry flan immediately. Spot-on observation about interns! Let us know the after-effects of your strawberry flan ingestion … or maybe not. Thanks for visiting Lame Adventures-land. I can never resist a lame adventure. Then you’re definitely visiting the right site Kate! I had to laugh out loud at the line about everyone who went to search disappearing. Sounds like you had your very own Gotham City Bermuda Triangle. Happy birthday to (not) Under Ling (anymore).! And have a wonderful weekend, my friend. What we endure for a piece of mangled cake! I hope you’re having a wonderful weekend, too, Kathy. I’m sorry. I borrowed your summer intern for a few minutes. She quickly dropped by my flat in Montreal – Christ, she’s efficient – and took a few pictures of me for Time Magazine. If I was thinking, Le Clown, I should have just commented on your site, “Send Summer Intern back to Gotham now! It’s time for cake!” She might have screwed up and sent you in her place by mistake — complete with your suckling sock monkey. That would have made interesting conversation over cake. Dang …. Move over Keystone Cops and gve e a slect of dessert! It’s funny you mention those guys for I considered revealing that Elsbeth, Greg and I did come close to colliding! We have a vendor at work who keeps bringing in his special, homemade cupcakes. He swears that they’re all in demand (by squirrels?). I cannot figure out how anyone can so consistently ruin a cupcake. I believe the ingredients include some type of fluid but he appears to be missing that part of the recipe. I love a fruit tart and would make one but I’d eat the entire thing. I content myself with wandering over to my sister’s raspberry bush and having dessert there. “I believe the ingredients include some type of fluid” — I don’t know why but motor oil immediately came to my mind. How great that you have a raspberry bush in your family! The only living thing we cultivate is Thurber, my sister’s dog. I certainly hope not. Because if the vendor is really missing a fluid in his recipe I am not sure motor oil would help. Not even the squirrels would touch them. On the topic of squirrels, daughter #2 (kid #3) who is just learning to drive pronounced her dictum that she won’t be slowing down to avoid hitting squirrels on the tree lined avenues of our little burg in Essex County’ NJ. I think it’s a tad harsh but the little one WAS traumatized as a youngster when a squirrel was startled amid a pumpkin eating frenzy on our porch and proceeded to scamper off the porch via her scalp. It’s been about 8 years but the squirrel is now living on borrowed time. As spokesperson for all the squirrels of Essex County, including the Pumpkin Eating Scamperer (now the father of 842 residing in the tri-state area), they appreciate your squirrel alert that there is a killer on the road. They give you a 21 nut salute. This is totally unrelated, other than I could really go for a raspberry tart about now, but I’m not sure where else to let you know of my response to your kind and thoughtful response to my current blog post (because I haven’t taken the time to figure out how people can sign up to know when I respond). This is the discussion group I refer to in my response to you, that I started in April; this is my caregiver advocacy so far and we’re working on more. If you’re a member of Linkedin, you can always email me through there. Once on Linkedin, you probably will have to search for this group and then topic for discussion. Discussion: Caregivers: What are your experiences? As a sole caregiver for my mother, 97, who has dementia, I find caregiving to be spiritually life changing, among other things. Ling — the original, folks, and the mother of my banner! We miss you, too, buddy!